Man addresses a smartphone in his hand. Man: I’m hungry, where can I get some food? Voice from smartphone: It was the best of times, it was the worst of times. Voice from outside the panel: No, no! 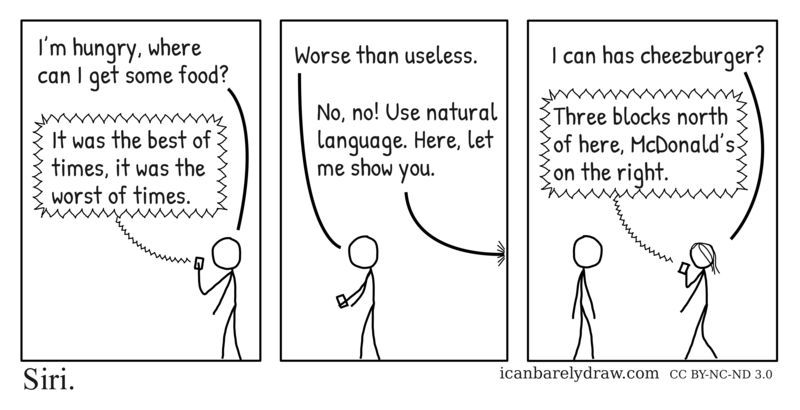 Use natural language. Here, let me show you. In the next panel, a woman is seen holding the smartphone. The man watches empty-handed. Woman: I can has cheezburger? Voice from smartphone: Three blocks north of here, McDonald’s on the right.